WrestleMania VIII was the eighth annual WrestleMania professional wrestling pay-per-view produced by the World Wrestling Federation (WWF). It took place on April 5, 1992 at the Hoosier Dome in Indianapolis, Indiana. This was the last WrestleMania to be held in a stadium until WrestleMania X-Seven. The Theme Song of this event is called "Worldwide Spectacle" by Jim Johnston. The original plan for the main event was the long awaited bout between Ric Flair and Hulk Hogan for the WWF World Heavyweight Title. The two had wrestled against each other in several house show matches and a televised tag match but never in a big money bout. Rumors persist that the 1990s "Steroid Scandal" forced a change in the main event booking. However, this has never been confirmed. 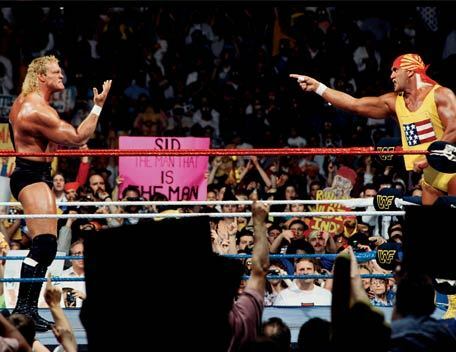 For storyline purposes Sid Justice lobbied to wrestle Hulk Hogan due to tensions starting between that two that had begun at that year's Royal Rumble. Hulk Hogan and Ric Flair would finally have their long awaited pay-per-view match two years later. In 1994, Ric Flair had been back with World Championship Wrestling (WCW) for over a year and Hulk Hogan had just signed a contract with the promotion. The two met for the WCW World Title at Bash at the Beach 1994. Hulk Hogan would not only make his WCW debut against his dream opponent but he would also win the match. The two would then have a on/off again feud for the next six years.